Share a feeling of peace and harmony by sending this serene rose and calla winter bouquet to a loved one's home in time for their celebration. 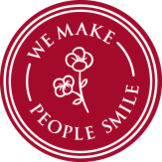 Buy flowers online today and send them around the world with international shipping to over 100 countries. Wish someone a happy holidays with our beautiful selection of Christmas flowers for 2018. For many, Xmas is a time of reuniting with family and friends, however, for some, work and distance make it impossible to return home for the holidays. Luckily at FloraQueen, we have the solution. With deliveries to over 100 countries worldwide through our international delivery service, there’s nothing stopping you from shortening the distance with the help of an arrangement of flowers. Due to the cold December weather, many people don’t think that flowers are very Christmassy. However, there are lots of special Christmas flowers which are grown to surprise loved ones near and far with some extra Xmas magic. With their deep red, vibrant green and brilliant white hues, they will be sure to evoke some seasonal warmth that your friends and relatives will love. Ordering Christmas flowers with FloraQueen is super simple. 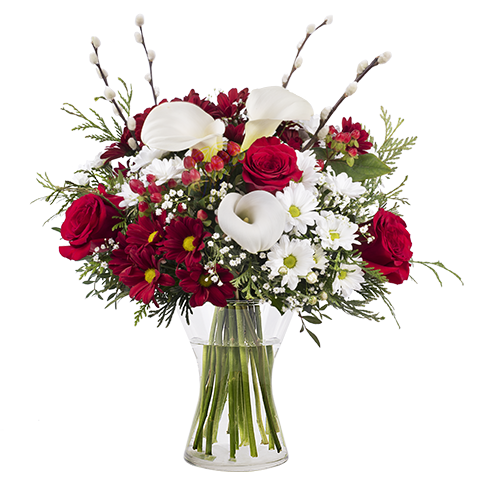 In a few clicks, you can send a beautiful fresh surprise bouquet almost anywhere in the world. Tell us where and when you’re sending your surprise - remember we deliver in 100+ countries! Add an optional written message - don’t worry it’s free! Make your order more amazing with a premium extra - a box of chocolates at Christmas just feels right, doesn’t it? We can deliver up to the 24th December in most countries. Our last guaranteed orders for Christmas in most countries must be made by December 23rd at 11:00 CET. We can take orders until the 24th for deliveries in Spain and Italy. As most florists are closed for Christmas we cannot deliver on the 25th December. We can deliver flowers on the 26th in locations where this date isn’t observed as a public holiday. For example, you can make a delivery in France but not in the UK. It wouldn’t be Christmas without beautiful decorations. Natural decorations like Christmas trees, mistletoe or holly wreaths are already well-established traditions, so why not Christmas flowers too? Add a unique touch of natural flair to the decorations in December by sending a poinsettia, some amaryllis or maybe a few lilies to enhance someone’s decor or to start your own Christmas tradition. If you’re feeling extra ambitious, perhaps you could send flowers for your loved ones to decorate their Christmas tree with.